If there was any doubt just one week ago, it is now abundantly clear that the Occupy Wall St. movement is not an isolated phenomenon. It has reached towns large and small and has proven to resonate with individuals from a variety of backgrounds – from the politicized ‘usual suspects’ to those previously reluctant to participate in any such demonstration – who are recognizing the criminality driving the financial services industry and connecting their concerns to a broader anti-capitalist politics. Though it may be too soon to speculate about OWS’s long-term prospects, it is safe to say that this is one of the most encouraging developments our side has made in recent years. Here are some on the ground reports from comrades across the country. Occupy Portland’s march on Thursday October 6 was huge—over 10,000 people jammed Portland’s central square after marching through downtown. The participants were an extremely diverse group of white people — all ages– though best represented by the 20-30 somethings many on bicycles. Several drumming bands and music groups kept us all moving. There were mostly homemade signs and the overwhelming message was “we are the 99%,” but lots of other ideas got expressed—from stop Israeli Apartheid, to “They call it the American dream because you have to be asleep to believe it”. Marchers called for an end to corporate greed and corporate personhood, getting big money out of elections, jobs, debt relief, health care. One of the advantages of a middle of the week, mid-afternoon march through the central retail/office district was that the streets were full of people and office workers hung out the windows many with thumbs up, and some dropping confetti. At the last General Assembly before the march, the organizing group was very concerned about keeping everything legal; they advocated for getting a permit, but participants at the GA refused to consent. Ultimately, the city was told we’re marching without a permit; the organizers gave the police the route the morning of the march. At the beginning of the march, the organizers tried to keep the crowd on the sidewalks but the crowd was so large and so ready to begin that they swarmed into the street. The Mayor agreed to allow people to camp out in two parks next to each other downtown—and the police closed off the street so people could flow between them. The huge size of the march encouraged the police to take a laid back position. Police allowed the group to set up tents even though tents are illegal in city parks—an ordinance that targets homeless people. A test of this movement’s momentum will be this coming Saturday at an anti-war and labor march, planned many months in advance. Until now, Occupy Portland has been consumed by the details of setting up and protecting the encampment with the police hovering, and no one is venturing proposals for what will happen next. But all kinds of organizations and organizers are engaging with the encampment and the huge turnout for the march has energized everyone. Occupy Salt Lake had been coming together for over a week before it was launched on October 6. Leading up to the event, open daily discussions were held at the public library about OWS and the economic and political difficulties experienced by “the 99%”. About 250 people rallied on the morning of Thursday, October 6th at the State Capitol in about the worst weather possible in Salt Lake City (SLC) – an early winter storm with heavy rain in cold and windy thirty-degree weather. 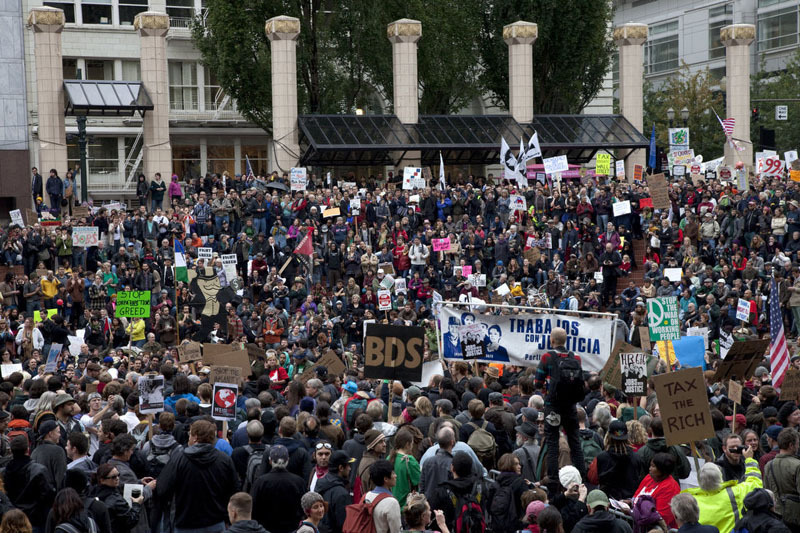 Numbers grew during the march, which stopped for brief protests at the Federal Reserve and major banks along the way. According to reports in the media, local and state government officials were saying that an ‘occupation’ would not be allowed since overnight camping is illegal on public property. US Senator Orrin Hatch said, “We are going to have riots in this country because of what these people are doing.” But the city and police authorities were cooperative as several hundred people built a tent city in Pioneer Park and prepared to stay around-the-clock indefinitely. Congressman Jason Chaffetz, who had openly considered challenging Hatch in the Republican primary election, visited the encampment October 7 morning and expressed solidarity with Occupy SLC’s right to protest. Democratic SLC mayor Ralph Becker put out a statement saying he supports “residents’ rights to peaceful protest and free speech.” This variegated support corresponds with the wide political diversity from right to left now participating in Occupy SLC. In the early afternoon on Friday, October 7, a small group of activists gathered in Reynolds Park for Occupy Madison, bringing the nationwide #occupy movement to the site of the 2011 Wisconsin Uprising. Hourly informational meetings commenced at 1:00 pm, and, as the afternoon carried on, the crowd grew. Over 150 people attended the first general assembly, where the group began to establish a procedure for self-governance, plan future actions, and discuss their reasons for joining the #Occupy movement. The event received extensive local media coverage. The size of the occupation fluctuated during the weekend, and early attempts to organize events have met with uneven results. Many of the lead organizers have little experience with political organizing and some do not live in Madison. As a result, the occupation was initially disconnected from the local activist community. Meetings and organizational strategies have improved as local activists joined the occupation. Its future is unclear. Madison Police have set a firm end-date for the occupation and while the first deadline, set for Sunday, was extended to Monday evening they likely could end the occupation whenever they wish. The survival of Madison’s fledgling occupation will depend on its ability to establish solidarity with other local organizations, especially unions. Tuesday, October 4th was the second general meeting for OccupyPhilly. This second meeting had, to my great surprise, over 1,000 people in attendance, up from 200 at the first meeting. It was overwhelmingly young people, mostly white, with a decent gender balance. Many different organizations were represented, including the Green Party, Socialist Action, DSA, Philly Jobs with Justice, and some others. There was a very strong energy in the room. Despite how skeptical I was about everything, I could not help but get a little excited about it. The most positive thing about this meeting was the amount of people I saw who are not part of the Philly activist scene or involved much in politics. I saw many students from Temple University who were not in any student organizations or involved politically, and even some old friends from high school turned up. The point of this meeting was to decide on a place, date, and time to start the occupation. Consensus process was used, and it was effective enough at helping us to decide that we would occupy starting at 9am on Thursday, October 6th. There were no concrete demands or goals discussed, as seems to be the case in many other cities. After this was decided (it took about two hours) we broke up into committees: education, labor, arts and entertainment, medical, legal, and sports and recreation were just some of them. Oct. 6th was the first day of the occupation. When I arrived there were a few hundred people there, mostly young and white. There was a decent amount of creative, homemade signs. At the general assembly, introductory remarks were made, and they began explain the different committees. This took a long time because there are so many different committees and everything had to be repeated twice so everyone could hear. They were not finished with this process yet when I had to leave two hours on. One thing I find troubling is that there has been no attempt yet to reach out to the many devastated African American communities in Philadelphia, those getting hit the hardest. However many comrades have suggested that we should not just stand on the sidelines and criticize this. We should be participating, helping to build it and learn from it, despite all the weaknesses. It is generating excitement, and people are acting outside the traditional political parties. In the Philly branch most of us agree with this assessment and have been plugging into different committees, doing what we can. More #occupy reports continue: Occupy Together Reports from the Ground, Part Two.